Suggested Use: Take 3 capsules 2 times a day to promote your immune system’s defense. 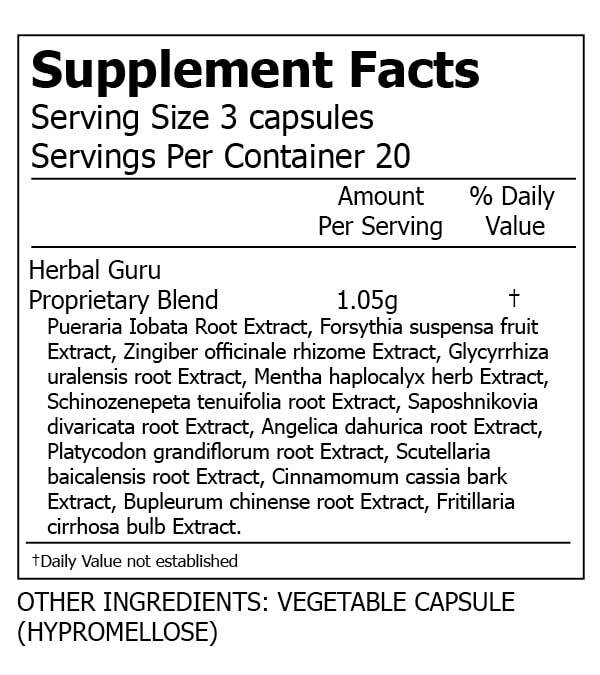 Herbal Guru Proprietary Blend: Pueraria lobata root Extract, Forsythia suspensa fruit Extract, Zingiber officinale rhizome Extract, Glycyrrhiza uralensis root Extract, Mentha haplocalyx herb Extract, Schizonepeta tenuifolia herb Extract, Saposhnikovia divaricata root Extract, Angelica dahurica root Extract, Platycodon grandiflorum root Extract, Scutellaria baicalensis root Extract, Cinnamomum cassia bark Extract, Bupleurum chinense root Extract, Fritillaria cirrhosa bulb Extract. ​**These statements have not been evaluated by the FDA. This product is not intended to diagnose, cure, treat or prevent any diseases. DO NOT exceed recommended dose. Consult your physician prior to using this product if you are pregnant, nursing, taking medication or have a medical condition. DO NOT USE if the printed seal is broken or missing.